The odds are not in the country's favor, experts say. The threat of technical recession is practically banging on Singapore’s gates after the city-state released a set of unexpectedly weak export figures in August. Technical recession, defined as two consecutive quarters of negative quarter-on-quarter GDP growth, has become an even bigger possibility after Singapore’s non-oil domestic exports (NODX) booked a steep 8.4% year-on-year drop last month. This is much more severe than consensus expectations of a 3.5% contraction. Analysts warn that the poor numbers paint a dire picture of Singapore’s manufacturing sector, which contributes around a third of total economic output. “The economy is on the verge of a technical recession. Indeed, the manufacturing sector is already in recession, having contracted for 3 consecutive quarters in year-on-year terms and for 3 out of the past 5 quarters on a sequential basis. Today’s set of numbers will only add to the recession side of the scale,” said DBS economist Irvin Seah in a note. Seah also noted that “the ugliest part” of today’s data is the 4.6% month-on-month decline in NODX, which has effectively wiped out the 0.2% gain in the previous month. Hak Bin Chua, ASEAN Economist at Bank of America Merrill Lynch, said that the weakness in manufacturing is unlikely to be set off by the services sector, which also expects slower growth in the third quarter. “The odds are more than even that the Singapore economy slipped into a technical recession in the third quarter, in our view. A technical recession will mean that GDP growth probably fell below that revised range, probably around 1%-1.5% for the full year,” he said. “The deflationary environment that had been plaguing Singapore’s trading partners due to the lower oil and other commodity prices is exerting its impact not just on oil-related exports, but had spilled-over to non-oil related exports. The dovish reactions by many central banks since the start of this year had further aggravated the decline in their respective currencies against the SGD, resulting in both a decline in Singapore’s export competitiveness,” Tan noted. As manufacturing slows, analysts believe that the Ministry of Trade and Industry (MTI) will downgrade the full year GDP growth forecast to about 2%-3%, from the current 2%-4% range. 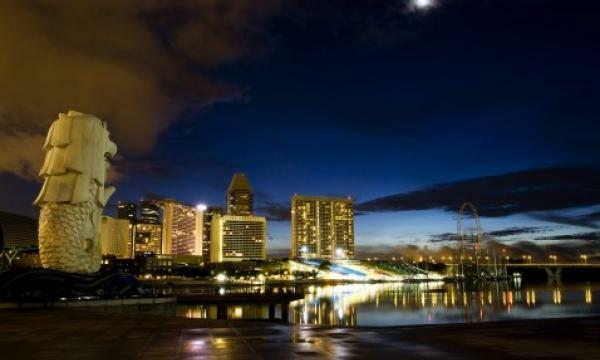 Singapore's economy contracted 4.6% quarter-on-quarter in the second quarter, sharply lower than consensus expectations of a 0.8% increase and a reversal from the 4.2% growth in the first three months of the year.